Lotus lifted the roof of the Paris Motor Show in one of the most bizarre spectacles ever seen at a motor show. The manufacturer revealed one new concept car after another until the stand was straining under the weight of no fewer than five proposed new sports cars. There's a replacement for the Elise, a new Elan, a new Esprit, a four-door Aston Martin Rapide-rivalling concept called the Eterne, and the Elite which, it turns out, comes with a full folding hard-top roof, not a Porsche Targa-style open section as we had first thought. 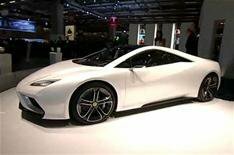 If the spectacle of so many new models was not enough, Lotus rolled out one celebrity after another to unveil the cars including Brian May, Naomi Campbell, Steven Baldwin and Micky Rourke. > Lotus Eterne: click to enlarge It was also announced that Motor industry grandee Bob Lutz with a long career at BMW, Ford, Chrysler and General Motors behind him has joined a kind of star chamber which aims to help the company navigate through the hectic period of make-or-break expansion and renewal it has revealed with unprecedented openness. • Esprit - 'An exclusive supercar' powered by a supercharged V8 pushing out 550bhp or 620bhp. Due in 2013 and likely to cost from 120,000. • Elan 'Muscular physique with perfect poise.' A Porsche 911 rival with between 400bhp and 470bhp. Due in 2013 and set to cost from around 70,000. • Elise 'Agility, performance and style taken to a new edge with the latest incarnation of a true drivers car.' Due in 2015. Likely to weigh around a tonne and offer 300bhp to 350bhp. • Elite The Elite gets a folding hard top, and the option of hybrid power matched to its 5.0-litre V8. It's due in 2015. • Eterne A four-door rival for the likes of the Aston Martin Rapide. Due in 2015 and costing 120,000+. Power comes from the same 5.0-litre supercharged V8 as in the Esprit and Elite.